Dr. Preetinder Singh Chahal has done his MBBS from MGM Medical College, Kishanganj and Chandigarh. Dr. Chahal has rich experience of more than 5 years in the field of anesthesia. 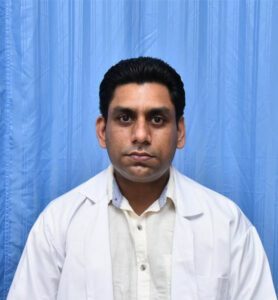 He is expertise in ventilators handling and all kind of major surgeries He published his research national paper on VAP( Ventilators associated pneumonia) in 2013. Dr.Chahal apply his knowledge of medicine to fulfill the primary role in the operating room, which is not only to ensure comfort of patient during surgery, but also meet the patient prior to the surgery and discuss the medical history, lab results and anesthesia plan. Dr. Chahal also provides specialized care for all surgical specialties including Neuro, Bariatric, Ortho, Pediatric, Gynecological and Obstetric, ENT, Plastic surgery and other General Surgeries. Presently he is working as Head of the department in ICU at JP Super Specialty Hospital, Zirakpur.